Since forming the low on Oct 26, 2018 low, Nifty has rallied higher and now is challenging the 2018 high (11760.20). A break above 2018 high will signal that the Index has ended the entire correction from 2018 high. A break above 11760.20 will also rule out the possibility of a double correction in Nifty. Our current view anticipates this breakout, but the actual break is going to validate the view and opens further upside. 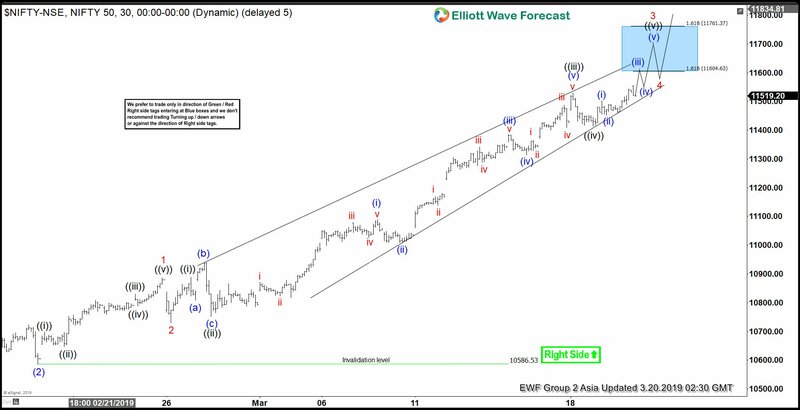 The rally from Oct 26, 2018 low is proposed to be unfolding as an impulse Elliott Wave structure. Wave (2) of this impulse ended at 10586.53. Wave (3) rally is currently in progress with subdivision as an impulse. Up from 10586.53, wave 1 ended at 10887.1 and wave 2 ended at 10729.30. Near term, dip is expected to find buyers in 3, 7, or 11 swing for further upside within wave (3). As far as pivot at 10586.53 low stays intact, expect Index to extend higher. For completeness, we also present an alternative view. In the alternate view, the rally from Oct 26, 2018 low takes the form of a zigzag Elliott Wave structure. In this case, Nifty should end the current 5 waves up from 10586.53 as wave (C). Afterwards, the Index will turn lower aggressively without breaking above 2018 high (10729.3).